By now, I hope that most of you have learned that Moto Guzzi now owns land speed records in two classes (1000cc Pushrod Production and 1000cc A Frame Partial Streamlining Pushrod). Both were won at the Bonneville Salt Flats in October of 1999. Obtaining these records was the result of a remarkable team effort that was conceived and executed in three months; mostly using the Internet. This seems fair as it started out with a teasing remark I made to the members on the Moto Guzzi Internet list early in 1999 about the fact that two Harley Davidsons/Buells set some records in 1998. I opined that Moto Guzzi should be able to top them. This initial remark garnered some interest, but it quickly died down. A few months later someone (I think it was Sheldon Aubut.) made mention of it again and for some reason (probably because the weather was warmer), it started an active discussion: mostly a lot of breast beating (i.e., "my Guzzi can beat that"). After a few days of this high testosterone chatter, Sheldon issued a challenge to the membership on the list to stop talking, do something about it, and he asked for volunteers to go after the record. It was mighty quiet for a few days. I sent Sheldon an email that basically said I'd like to be involved somehow and it didn't matter how. I also made mention that if no one stepped forward in the next week to act as project manager, I'd give it a shot, even though I felt I was totally unqualified to do it. The next day Sheldon posts to the list that I volunteered to lead the team. Yikes! Well, project management is project management and I've done that before. I have a simple guideline for this stuff - let the subject matter experts do what they do and don't get in their way. It works with computers and networking, so it should work with motorcycling competition. http://www.inredllc.com/lsrguzzi/index.html. After some preliminary team discussions, we laid out a course of action and developed a budget. For a number of reasons we decided to go after the 1000cc record in 1999 and to fund the effort through owner donations and limited outside sponsorship. After that, all we had to do was raise some money. The easiest place to start was to ask Moto Guzzi owners to donate. We also figured we could sell some special T-shirts. So we did both, and the response was pretty good. Some people were extraordinarily generous. Though we appreciate every penny everybody contributed, I especially want to mention Gary Overby, Will Fitzgerald, and Sidney Conn for their contributions. Money was, and remains, a critical issue in attempting anything like this. We provided some recognition incentives for donators. The talent and commitment of good people is the most important factor, but you need money to realize success. During the three months from start to record breaking (doesn't that sound good? ), we communicated via email and the chat room. You might be surprised to know that I'd never met any members of the team and I don't think many of them met each other until they hit the salt! In fact, the only people I've met as I write this are Mitch and Todd, both of whom I met during the BarberButt 99 and Ducs Fly South events. And up to last week, I'd only spoken to a couple members of the team via telephone. Really amazing when you think of it. How could I forget the Moto Guzzi balloon! Sidney, who also supplied the bike, built us a magnificent hot air balloon. 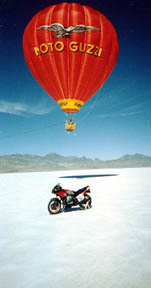 No way could I do justice to the impact the balloon had on the whole Bonneville scene. Truly, we soared above the rest. Also I need to call special attention to Russell Duke. Russell built us a monster! He had advice and counsel from Todd and Mitch (our riders- one record each), Manfred Hecht of Raceco, and others; but it was on his shoulders that all our hopes lay. He did a great job while under a lot of time and "performance anxiety" pressure. Thanks again Russell. To top things off, it's always been in the plans to attempt an Ironbutt Association ride with the bike, possibly to a destination that should surprise and delight you. Stay tuned on this. We also have plans to sell shirts and maybe decals - celebrating this year's accomplishments - just the thing to wear into your local HD dealership this winter, J and we are going to see if we have enough quality film footage to make a video. We'll post to the Internet, of course, and let you non-connected folks know all the details by way of the MGNOC News. One of the things that I regret about the way this year's effort took place was that things were so fast paced, we only had a short amount of time to get you all engaged. There're something like 3200 MGNOC members, and only about 600 of you are on the Internet list. That's an awful lot of brain power, talent, and support that we left on the table. We'll do a better job for next year. By the way, it's a great excuse to get a computer and get connected! When we started noodling this project on the Internet, I decided to donate the use of my beloved 56,000 mile LeMans V for the attempt. I understood the risk of having it rolled up into a ball but felt that it was the model of Moto Guzzi which would give us the best chance of success. Even though I'm emotionally attached to the bike, I wanted it to go to the team with no strings attached. The biggest string (admittedly very tough for me because I'm a participant and not an observer) was not insisting that I be a rider if there were those more qualified by virtue of size, weight, frontal area, experience, etc. In any case, by that time Walter Barlow had been appointed as Project Manager so I sent him an email, and after some consultations with other members of the proposed team, he accepted. You will hear a lot from the team about how great was the experience, the bike, the people, the Salt, the competition. etc., etc. It's all true. My most pleasant surprise was to find that everyone on the team was even nicer than I expected considering their email postings. From my perspective, however, some heavy duty credit goes to Sheldon and Walter for their organizational abilities, without which Harley Davidson would still own our two records and we'd still be clacking on our keyboards. Organizing something as complex as this is no mean feat, believe me. In 1980, I organized an expedition to fly a balloon over the North Pole. In the high Arctic your very life depends on your team and when things start going wrong, every personality glitch becomes hugely exaggerated. I assembled a team of ten people that I knew were compatible. Why I'm so impressed with Walter is that he assembled a group of compatible people that he had never met and who didn't know each other! When things started going wrong on the Salt, we didn't all agree on remedies, but not one harsh word was spoken. Instead, every one became more resolute, and we all pulled together. Sheldon is an absolute peach and provided a calming influence. Russell, Todd and Mitch did the majority of the very competent wrenching, and the rest of us helped with moral support, balloon crewing, running for parts, doing PR and handling the little important details. Steve Midgely from Salt Lake Motorsports went way out of his way to be helpful, driving the enormously boring 120 miles to and from Salt Lake City several times. Will we be there next year defending what we achieved? When we were all out for dinner one night, we met one of the grizzled old tech inspectors. He asked if we had been to the Bonneville Salt Flat races before, and when we told him we hadn't, he just smiled and said, "You'll be back." Putting this bike together was a lot of work, but I knew it was worth it after Todd made the first run at Bonneville. On the break in run, at partial throttle, we had gone faster than the existing record by 2 mph! After four days of running and tweaking, we had set two new records: the first, ridden by Todd Ross, was the 1000cc Production- Production Pushrod (P-PP) record at 134.441 mph. The second, ridden by Mitch Freshour, was the 1000cc Special Construction Partial Streamliner-Pushrod Gas (APS-PG) at 142.271 mph. Let me go back a bit and tell you all about some of the bike prepping. After my friend Rock delivered the bike to me, I took the motor out of the frame and stripped it for inspection. Most of the components were in decent shape, but after all, it's a Guzzi, and at 60,000 miles, was just barely broken in! As I looked at the parts laid out before me, a plan started to hatch. If we could raise enough money, we would install 90mm Wiseco pistons, Norris 382 race cam (a Manfred Hecht grind), chrome moly pushrods, RAM aluminum flywheel/clutch assembly, and have Manfred flow the heads and provide a race valve job. As the new parts started to come in, the motor started coming back together. When building a hot motor, nothing is ever a "drop-in." At each stage of assembly, I would measure, modify, verify, and continue. For instance, after I installed the cam, I discovered that the rod bolts were knocking into the cam lobes due to the largely increased cam lift. So I whipped out the die grinder and clearanced the rod bolts to .050". Then when I put the cylinders on, the cylinder head studs protruded too far up and interfered with installing the rocker arms. This was because I had trimmed .040" off the cylinders to set the squish at .038". Out with the die grinder again. I thought I had finally clearanced everything, so I bolted it all together and torqued the heads, only to find that, due to the cylinder trimming, the sleeves now extended further down into the crankcase, contacting the crank counterweights, and causing the motor to bind. Needless to say, my die grinder has gone through several stones while hand fitting this motor. The goal of performing all of these modifications was to provide a reliable, powerful, well thought out motor that we could depend upon to carry us to a land speed record. It exceeded my goal by gaining two records. Forza Guzzi! I would like to express a big thank you to Manfred Hecht at Raceco for the cam, headwork, and engine building advice. He is a great asset to the team. All in all, I am very satisfied with our first time results at Bonneville. The bike will go faster with a bit more development work. I look forward to going back over the next few years and raising the bar even more. With the team that we have, anything is possible. It isn't often in one's life that he gets to participate in an effort that is truly unique. This was one of those times. 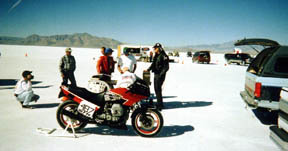 A time when a group of people from around the country who had never met each other, arrived at the Bonneville Salt Flats in Utah and proceeded to shatter two Bonneville Land Speed Records. The fact that this team was put together over the Internet, and with the support of an Internet mailing list consisting of 650 Moto Guzzi riders from all over the world, makes it one of the most unique "teams" in racing history. This may even be the first time this feat was ever accomplished. When the week was over we held the record we had gone after for and another record that started as just a way to pass time while waiting for a part to arrive, and ended with a second class record. All of the money was raised from the 650 list participants, MGNOC members, and a last minute donation from Moto Guzzi North America. Once the team got together we turned out to be completely compatible and as good of a team on the Salt Flats as we were in cyberspace. This truly was a "TEAM". And this "TEAM" will be back for another whack at the records next year. The first thing that strikes you is the sheer size and nothingness that surrounds you as you fly down the cone-marked "roadway" that leads to the pit area. In the distance you can see a small collection of vehicles, tents, and people. When you pull into the pit and start looking around, you quickly realize this is a group of people who have been doing this a LONG time. So this is where the old hot-rodders have gone? You can go down to your local mall about one night a week and see the highly polished, tricked-out show cars with all the performance bits bolted on. Those cars may get the chance to cruise to and from the mall, but that is the extent of their travels. Wouldn't want to get them dirty, would we? Contrast that to the Bonneville Salt Flats where high performance drivers get their fire-breathing creations out on the most corrosive environment available and really push them to see what they'll do. This year was the 51st anniversary of running on the salt, and I have no doubt some of the people at the flats this year were involved in some way back in the beginning. The vehicles entered in competition range from the most serious of modern automotive achievement to someone's backyard dream made out of whatever rolling stock he could scrape together and stuff with a real motor. Motorcycle people and car people intermingle and share knowledge, parts, tools, and camaraderie. There are no barriers between the salt veterans and salt rookies. These folks are involved simply for the love of speed and pushing the limits. They're all more than willing to help the next potential record-holder to become addicted. After two days and over 2000 miles, I first caught sight of the great salt desert that is home to the Bonneville Salt Flat speedway. From Interstate 80 west I strained to get a glimpse of the race course and pits as I slowly got closer. One of the first things you notice while traveling out here is time and distance are altered from normal perspective. No matter how fast you try to move down the road, time seems to ignore your efforts and everything continues to move in slow motion. I exited from I-80, and after driving for a few miles on the Bonneville access road, on which the posted 45 mph speed limit is universally ignored, I was motioned onto the salt flats by Bonneville volunteers. It's about a ten-minute drive at 60 mph across the salt before you reach the nomadic village that makes up the pit area, and it was here I first met Russell Duke in person for the first time. Russell was accompanied by Woode, his good friend and van co-driver. Woode had brought a video camera, and over the course of our stay, he must have shot enough tape to produce a feature length documentary. I want to see that video when he finishes editing it. I shook hands with Russell and we began what was soon to become the making of a great team. For the next few days time seemed to be accelerated for the LSR team, as Russell, myself, and Todd Ross alternated between wrenching on the bike and providing support for Todd as he made his record setting runs. Meanwhile Sheldon was making daily posts to the Internet site and Ed "I won't take no for an answer" Holmes was successfully negotiating roadblocks and locating and acquiring several critical items we needed. Sidney and his balloon pilot friend Erwin were busy giving people rides in the Moto Guzzi hot air balloon, while others were busy snapping pictures and filming video. In addition, we had plenty of help from the many pairs of eager hands belonging to all the Moto Guzzi folks who showed up to help. We always had help whenever the bike needed lifting, or footpeg brackets needed to fabricated, and there was a constant food buffet provided so the team could grab a quick bite. This brings up a point that I have found to be true of every Moto Guzzi related function, be it a rally, group ride or racing event. By definition, Moto Guzzi people are among the finest group of motorcycling individuals that I have ever been associated with. For me, this team and the accomplishments we achieved make up some of the most satisfying motorcycle related moments that I have been privileged to experience. It took only a few moments for total strangers to integrate into a strong, successful team that completed its goals with confidence, not only in setting records, but also in sharing and utilizing each others' capabilities as well. In addition, every one of us was having a blast doing it! Focusing on my own primary team responsibility, which was to help Russell work on the bike and to provide support for Todd as he made his record attempts, I was having the time of my life. It was just great to work alongside such a fun and knowledgeable group of racers and supporters. But it would only get better. A few days into the event when Russell and Todd approached me about riding, I tried to keep a level head and conduct a logical discussion about the opportunities available to us. Nevertheless, inside I was bursting with excitement! In the evenings at the dinner table, I would joke about the chances of my getting to ride, just in case the team might have forgotten that I was a back-up rider. Nevertheless, I was totally content with performing my pit crew duties. I had already made up my mind, after Todd had set the production class record, that even if I was given a chance to ride, and if I was able to go faster, that I would not back up my run and take the record away from him. The team had chosen Todd Ross as our primary rider, and he had done what the team had set out to accomplish. I saw no need to change that just so I could have a chance to ride. I suppose my decision may have had something to do with the team deciding to enter a separate class, but when I heard the news about registering for the modified class and I would be the rider, I was thrilled. Now I would be able to try for a record too! The ride down the salt flat on a motorcycle is unique. The surface is rough, and traction is questionable, but the speed is relative, and with the only visible landmarks being bright orange mile markers, it is difficult to judge how fast you are actually traveling. I tried to focus my attention on the only functioning instrument, the tach, and encouraged it to continue climbing as I made my attempts. Since the seat had been replaced with thin padding and tape, and my feet were on angle iron foot pegs located close to the rear axle, it was actually easier to lay on the tank and watch the tachometer than anything else. I quickly got in the habit of lifting my head only occasionally to glance through the windshield to check my position on the course. Then I would drop down behind the instruments and return to encouraging the tach to continue climbing past 8000 rpm. I managed to take four trips down the course, and with the help from a pair of plastic cup velocity stacks, I was able to reach an average speed of 142 mph. I will not soon forget that rush. There was also no doubt in my mind that I was now hooked on flying down the salt flat stretched out on a motorcycle. I want to take more trips down the course, and make no mistake, I want to go faster! They have a saying in Bonneville, and it's that the salt gets into your blood, and once it does, you can't stay away. I must have salt water running through my body now, and I can't wait to get back. The Moto Guzzi Land Speed Record racing team is a strong, fun-loving bunch of people who have managed to do something truly unique and positive for the Moto Guzzi name, as well as for ourselves, and I look forward to going even faster next year! I'm still rubbing my eyes! When I signed on, I figured that trying to break the record would be a dalliance of sorts. My best guess: the group's enthusiasm would dissipate, the friction of conflict would overcome, and rubber might never touch salt. For me, it's a lesson relearned. Some ideas, and the people bound to them soar when the conditions are right. I appreciate my ride on the coattails of those who made it really happen. Other than just the historical sense of being there at Bonneville for Speed Trials, which was in itself a great feeling, the sense that you were at a gathering of old friends was overwhelming. So many of those guys have been going there for 20 or 30 or more years, and yet they welcomed us graciously, even though we were definitely the rookies on the block. So many of them openly enjoyed our success. A special guy out there was Mike Mendoza, the Harley rider whose records we broke. He was constantly giving us little bits and pieces of helpful info, never resentful that he was going home without a new or old record in the books. I wish I could be more articulate about the way we were treated: they are a special group of people. I'm looking forward to seeing them all again next year. When I first heard the proposal to go after the LSR, it took all of two, maybe three seconds to know I had to be involved in some way, shape, or form. I offered to run a fund raising T-shirt sale. And also to make up caps, shirts, jackets, etc. for the crew. During the few days the Land Speed Records were being set, I can't count the times I was overwhelmed by the good news coming back from the Flats. I would anxiously sign on to the Internet to get the latest report. Then sit back to enjoy it. What a feat! As astounding as the results are, even more impressive to me, is the support that came from all over the world. This truly was a grass roots effort. I received orders for shirts from all over the USA, Sweden, Finland, Australia, The Netherlands, South Africa, England, United Kingdom, and the Isle of Man. It feels good to know that our T-shirts allowed so many to participate in this heroic event, and also that they will promote Moto Guzzi and our proud achievement to the world. Thanks go out, not just to the team, but also to the Guzzi fans: every person who bought a shirt, every person who donated time or money, every person who took the time to post a wish of success or a congratulatory on the Internet. Each shirt I sent out included laundering instructions. Today I want to add "wearing" instructions. "WEAR WITH EXTREME PRIDE!" I can hardly wait until Moto Guzzi Land Speed Record 2000! To Glen Bewley: Don't worry Glen, we'll find a way to abuse you yet! The LSR idea came out of some discussion I can't even remember the roots of now. But the first thing I remember doing about it was going to the Southern California Timing Association website and checking the record. One nineteen plus. Jeez, air must be thin out there, I thought. So the discussion got fired up on the list and to be honest, my first response was "Why doesn't someone grab a bag of jets, safety wire their LeMans, ride out there and just take the thing?" I stand behind the idea exactly that could have been done, but the team took it to the next level. They didn't want the record at "standard" speeds, but at well above that. So the group effort was born. And what a birth it was! Walter Barlow absolutely took the bull by the horns and soon there was a bike, then an attempt at raising funds. LOTS of people are buying "Attempt" shirts now that it's DONE. Of course, thanks to all, but let's show a little faith in advance next time around! As much as I would have liked to have been more involved, I was fairly well grounded by the seasonal demands of my career, and could only offer up some financial assistance. But knowing all was in good hands, I didn't fret too much.